I’ll also show you a simple daily technique you can do to nourish your overworked and tired psoas muscles. Often referred to as the iliopsoas (really two separate muscles: iliacus and psoas), the psoas is usually thought of as a hip flexor (those muscles that bring your thigh forward and up towards your torso and vice versa). Not really a true hip flexor, the psoas is the only muscle in the body to connect your spine to your leg and it is involved in WAY more than hip flexion. 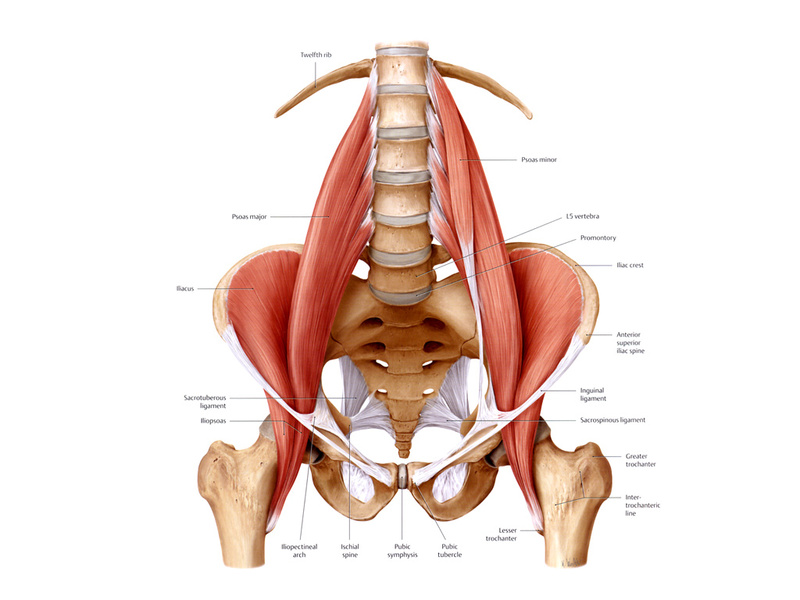 You have two psoas muscles, one on each side. (I am referring to psoas major; another muscle, psoas minor is absent in as many as 50% of us). Because the psoas muscles attach to both your leg and your spine (many places on your spine from the bottom of your spine all the way up to the location of your rib cage) and run through your pelvis, when they don’t yield (are tight) they can affect your posture in a variety of ways. 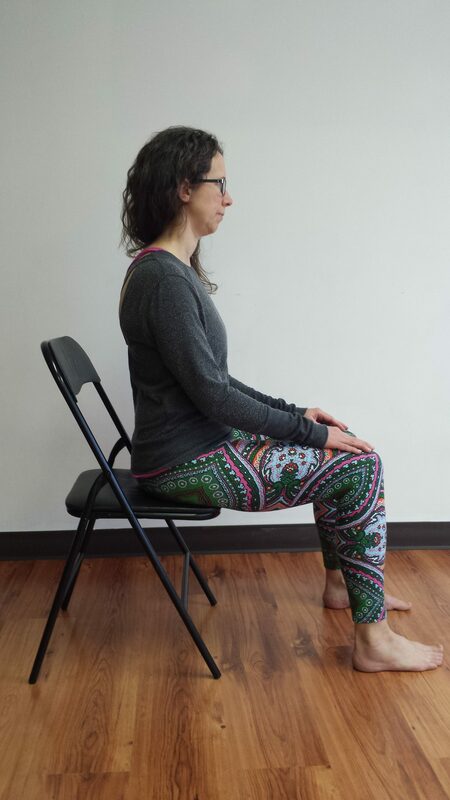 The position of sitting in a chair brings the two ends of the psoas muscle closer together, which means if you sit for hours per day, your psoas muscles will be passively shortened. The position of sitting is not the problem. It is the length of time you are in the position that creates a problem. Sitting a lot creates a dominant relationship between the spine, pelvis, hip joints and legs. Certain sports like cycling provide cardio exercise for those that have sedentary jobs but they also mimic a similar hip joint angle between the thigh and torso (hip flexion). I am not recommending you stop cycling! I am saying that if you are interested in maintaining all of your ranges of motion then you might want to look at where you are getting other joint angles in your day (like hip extension). AND if you are looking to improve the health and vitality of your psoas muscles then you will want to evaluate the total amount of time that you are putting your body in positions of hip flexion. Ok, now for the real fun. The lumbar plexus, a major centre of nerves to the back, abdomen, legs, pelvic floor and inner thighs, runs within the psoas muscle in most people. This means that an unhappy (tight or shortened) psoas can affect nerve flow to and therefore function of all of these areas. Whoah! Now you can see why so many of the issues in the list above can relate to a shortened or unyielding psoas!! The psoas is also connected with our fight or flight or freeze response. Think of a scared or startled cat (like a Halloween cat). The cat’s startle reflex instinctively and involuntarily rounds the spine. We have a similar startle reflex that creates a similar curl to our spine. The curled position is an evolutionary design to protect the soft organs in the front by rounding and presenting the spine. The psoas is at the centre of this reflex, a part of the fight or flight response. Our fight or flight response evolved for a purpose: to shut down systems (like digestion and reproduction) not essential for escaping danger and shift our energy to increase hormones like adrenaline and increase blood supply to the big muscles, essentially to help us run faster and fight harder to escape danger. The healthy pattern is to return our nervous system to rest and digest mode after the temporary dangerous event or encounter has ended. Yet in our current culture it is common to be living in a partial state of fight or flight all. of. the. time. High amounts of mental stress, poor eating habits and lack of sleep keep our stress hormones elevated, decrease the function of our digestive and reproductive systems, and maintain our muscles in a state of chronic tension. The psoas, with its many attachment points along the spine, and its relationship to the lumbar plexus as well as our startle response, is a major mover of our central nervous system and is intimately connected with our emotional state. When we are living in a state of chronic stress our psoas becomes exhausted, along with our adrenal system. In light of everything above, who doesn’t have something going on with their psoas? Somatic educator Liz Koch, one of the psoas muscle’s biggest advocates, refers to the psoas as “The Messenger of the Midline.” She encourages us not to go out and stretch, trigger point or palpate the psoas directly because the psoas is not the problem. It is just the messenger communicating that something else is out of balance within our system. It is exhausted. So what to do instead? As I promised to my psoas in My Ode to the Psoas, one of the greatest gifts you can give your psoas is a frequent practice of Constructive Rest. Constructive rest is a position that allows gravity to release tension out of your psoas. This might seem boring but practicing resting like this can do wonders for allowing the psoas to let go of any chronic holding pattern. It can help alleviate back and pelvic pain, as well as stress and anxiety, and just create a pause in our busy day to allow our whole system to reset. How to practice: Find a safe and quiet space to practice where you are warm and will not be interrupted. Lie on your back over a yoga mat or folded blanket. Bend your knees and place your feet on the floor. Knees should be about a 45-degree angle. Your feet should be parallel about hip distance apart. You want to have your head in line with your body with your neck in a neutral curve (chin is neither up nor down). Just allow your bones to rest. You are not forcing your spine to the floor or intentionally tilting your pelvis. You want your arms at your sides or resting on top of your pelvis as taking them overhead changes he relationship of the ribs and spinal curves and doesn’t allow the magic of the position to unfold. You can have your eyes closed or open but keep them soft and not focused on anything outside of yourself. Rest here for 10-20 mintues. As the psoas relaxes the spine may unfold and you may feel different parts of your spine come into contact with the floor. Try this out for a few days and notice what you experience. Feel free to message me to let me know what shows up for you! If you’d like to learn more about how to work with your psoas, check out my updated Psoas Workshop on Saturday February 24th. If you want to experience the magic of Restorative Yoga to help reset your nevous system, check out my Restorative Yoga Workshop: The Art & Science of Relaxation on February 25th. Come to both and experience a weekend of powerful practices to nourish your psoas, create new movement awareness, and regulate your nervous system!